Rich women abort whilst poor women die. Wikimedia Commons. 2018 has been a year of many achievements and challenges for women’s rights in Latin America. Despite many obstacles, the feminist movement continues to move forward as they demand sexual and reproductive rights, including the right to abort, that so many reject in the current conservative political context. Thanks to their fight and political mobilisation, women continue to gain more and more relevance in the public sphere, assuring that their gender doesn’t limit their access to opportunities in Latin America. A glance at the milestones of this battle over the past year are signs of a tough reality, but they also provide us with hope. The recent absolution of Imelda Cortez in El Salvador, the incredible achievements of the Green Tide that shook Argentina, and the murder of counsellor Marielle Franco in Rio are among the many events that defined the feminist struggle of 2018. At only 21 years of age, Imelda represents a symbol of the fight to end reproductive repression in Central America. Continuously raped by her step-father since she was 12, she became pregnant, but after suffering from ‘denied pregnancy’ due to the trauma she had experienced, she gave birth unexpectedly on the toilet in her home. A report that came from a doctor in the hospital in which Imelda was seen to was what led her into custody where she would remain for 20 months. The trial, characterised by delays, threatened to put her in prison for 20 years for a suspected homicide attempt in what was in fact an accidental birth. During these past months, her case has become a symbol of the feminist movement in El Salvador that from the very beginning has demanded justice for Imelda. What happened to Imelda is a representation of the tragic human rights abuses that women in the region continue to suffer due to such restrictive legislation regarding reproductive rights. Putting an end to the criminalisation of abortion and the incarceration of women who abort is one of the main objectives of the Latin American feminist movement. They believe the policies of the region punish the most vulnerable women of them all, that when faced with inequalities with regards to work and education, are the most likely to face discrimination. After a long judicial process and thanks to a huge wave of mobilisation in defence of Imelda, she was finally able to be reunited with her daughter. Her absolution represents a victory in the commitment of Latin American women in obtaining their rights. An impressive movement known worldwide as the Argentine Green Tide inundated the streets of this South American nation with more than 500 organisations in defence of women’s rights, as well as mobilising thousands more who demanded that the Argentine Congress decriminalised abortion. This historic mobilisation that took on international dimensions achieved enormous support in favour of free, safe and legal abortion, and has helped to ensure this issue will not simply disappear from the agenda. This battle that has achieved many victories throughout this year continues to face up to some serious challenges, particularly that posed by an organised, powerful backlash against their cause. Under the banner of the Green Tide, the movement must carry on without losing its momentum and it must assume new goals such as that of tackling conscientious objectors and the Christian lobby who seek to restrict legal abortion in any way they can. The fight will undoubtedly continue throughout 2019. 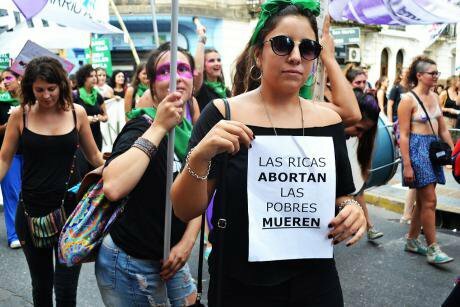 Activists have managed to create a movement that has the Argentine government walking on a tightrope, whilst those against the decriminalisation of abortion are aware that any decision that is taken in favour will create a powerful precedent that will only spread through Latin America. The assassination of Marielle Franco, a politician elected to the municipal government of Rio de Janeiro, symbolises the grave situation in which female activists, particularly those who belong to minority groups, currently find themselves in. Now, the openly sexist attitudes of the president elect of Brazil represent yet another potential digression for women and minorities across the country, which alerts us to the possibility the crime may go unpunished. Marielle personified hope for those who grew up in tremendously difficult circumstances, and showed that through political mobilisation, change was possible. It is for this reason that her murder was politically motivated. Since the very first days of his campaign, Jair Bolsonaro has provoked a strong reaction from the feminist movement. Thousands of women aware of the risks of the sexist, xenophobic and racist declarations of the presidential candidate took to the streets of the main cities of Brazil chanting the slogan ‘Ele Não’. However, the dimensions of the movement also produced a strong counteraction led by the evangelical church and the most conservative forces of the country. This reaction consisted of uniting voters under the slogan ‘Ele Sim’ and presenting Bolsonaro as a victim of unfair attacks, including a stabbing suffered during the campaign trail. The challenge this movement now faces is to continue opposing democratic backslides and threats to human rights that may occur once Bolsonaro assumes the presidency. These events have left their mark on the Latin American feminist movement of 2018, and the continuity of mobilisation into the next year will ensure that the resistance will not slow down, and will only emerge stronger. The women’s rights agenda will be judged by its capacity to create strategies that allow their transnational networks to become stronger, and its ability to avoid digressions in battles previously won in Latin America where a turn to the conservative right is currently sweeping through the region.